Sorin Group is a global medical device company and a leader in the treatment of cardiovascular diseases. Half of all cardiac surgery procedures in the world use Sorin Group’s technologies such as heart lung machines, oxygenators and cardiac perfusion sets. During cardiac surgeries, surgeons utilise protective caps to cover tubing and connectors in medical operating rooms. A key step in the manufacturing of these plugs is the cleaning process. To streamline manufacturing, ensure the highest cleanliness standards, and optimise resource, Sorin has selected MecWash Systems’ aqueous cleaning systems. The size of PVC protective caps manufactured range from 1/8” to 5/8” ID to match the tubing and connectors commonly found in the operating theatre. These single-use products are used to protect intravenous and suction tubes, as well as other necessary products required during life-saving surgery. Although protective caps are not used inside the body and are discarded after use, they are essential to protect the patients’ health and thus must meet very exacting cleanliness standards. Hence, it is crucial that these cap plugs are cleaned thoroughly prior to use. Originally, Sorin Group had relied on outside firms to clean these caps, but volume and cost considerations persuaded Sorin to bring cleaning in-house. Initially, ultrasonic dunk tanks were the most promising alternative solution. During the evaluation process, however, Sorin Group Senior Engineers found a detailed overview of the MecWash Duo aqueous cleaning system, after further inquiry, initial discussions between the two companies were positive. MecWash was familiar with the intricacies of washing plastics and vinyl. The MecWash flood, spray and rinse process has historically performed well on similar plastic and vinyl product designs, so test-cleaning trials at MecWash Systems were scheduled. 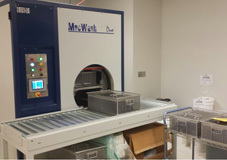 The MecWash Duo not only met the United States Food & Drug Administration’s requirements for cleaning agents used in operating rooms, but also met Sorin’s rigorous cleanliness standards. When considering which cleaning solution could be used in the MecWash Duo, previous dunk tank testing by Sorin was put into consideration. Having previously unveiled a Brulin chemical that met cytotoxicity test requirements, the Brulin 1990GD solution became a favorable candidate by Sorin for use in the MecWash Duo. Brulin product 1990GD was elected for use in the Duo for its antifoaming qualities during the spray wash and rinse phase of the Duo’s cleaning cycle. Due to the success of the MecWash Duo and Brulin 1990GD together, Sorin Group purchased the Duo, which was installed in Sorin Group’s Arvada, Colorado facility in October 2013. We believe Sorin Group’s return on investment for bringing the cap cleaning process in-house will be made within the first year of operation.